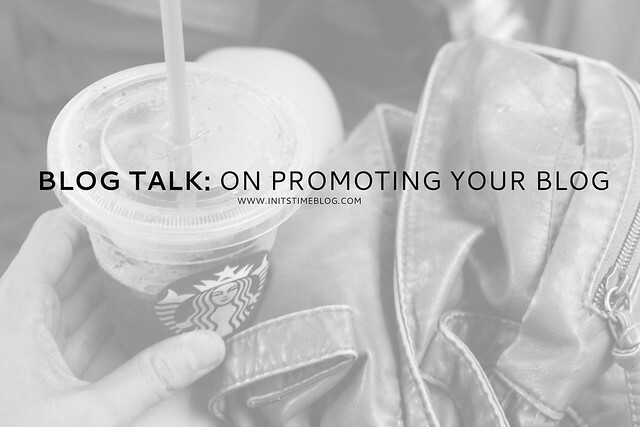 BLOG TALK | ON PROMOTING YOUR CONTENT. I'm sure you've all seen the pins, tweets, and blog posts on promoting your blogs. Or maybe I'm the only one who sees them on social media feeds? I see pins telling us "what you're doing wrong in blogging" and "what to need to change to grow your blog" and "why your posts aren't being pinned." But is all of that worth your time and effort in the long-run? Is it worth it to have 10,000 followers or 10,000 tweets, or 10,000 repins? Is that what blogging has come to? I know I'll likely come across as boastful, rude, and critical, but it saddens me that blogging is seen like that to some people. That blogging is still about the numbers, and not about the hearts. And that it's all about getting pins and follows and likes and that you're not a real blogger if you don't do those things. I get it, though. Really, I do. A lot of bloggers rely on this stuff for their income. They rely on promoting their own blogs because if they don't, they don't have cash for paying for rent or food. On a more personal level, I spent a good portion of my first year(s) blogging analyzing stats (or trying to figure out Google Analytics, haha). I spent a large amount of time wondering why my numbers weren't changing. But I've also spent a large amount of time emailing other bloggers, meeting with them in person, and praying for them, too. And to tell you the truth, I'd much rather do that than spend time trying to figure out how I can promote my blog and have it noticed. I know that I might be going about this all wrong, but when it comes to blogging, it's still all about the people, not the numbers. Does that mean I don't want people to find my blog? No, because I love meeting other people! But does that mean I'm going to be spending 2 hours each night pinning, tweeting, and promoting my posts? Unfortunately, no. Not only do I not have the time to do that kind of stuff, but I also just don't have the energy to! I may be failing in the promotion department, but I'm okay with that. Because when it all comes down to it, YOU matter more than my blog. So what are YOUR thoughts on promoting your blog? Have you found a great way to do it without spending too much time? Do you even pin/tweet/share your posts on other social media forms to begin with? Check out all the other Blog Talk posts here. And further proof that we're Blog Talk twins, check out Amanda's thoughts on social media and promoting your blog, too! I pinky-promise that we didn't copy/know about one another's posts! Lately, I'm feeling like I don't know if I even WANT my blog to grow like I used to. Or if I do, I might need to move away from it being a lot of photos of the boys and something else... which isn't real because it's not my life. I don't want my boys to have all this stuff out there in the world about them before they have an opinion on it. I try really hard to share things from MY perspective... so even if they're the topic, it's what was going on with ME during it. I don't know... constant dilemma. I love meeting people, like you, who I'd never have met in real life... but I'm worried about tons of people I don't know following me. I agree that some focus TOO much on just promoting when I think they should focus more on the content they create and just enjoying owning a blog. Blogging can be so much fun, I hate when people say that it's stressing them out. Well I don't hate it but it makes me sad! I kinda struggle with this too being a newer blogger. I'll pin, tweet, and facebook my posts once each usually and call it quits. Something about self promotion is still pretty uncomfortable to me, we'll see if that changes. And like you said, I'm happy to interact with the readers that I do have! This is the biggest struggle I have right now. I want those reader numbers.. because its tangible. Even though I know I have a lot more readers than what that little number on the side represents because every family member and friend of friends of friends read anonymously and never comment. I don't think I really want to get paid for this but it would be nice to one day have a med student or resident come up to me and say "hey! You are the one that writes on homegrowninky right?! I got a lot of help from your post about ___!" Or to be big enough to one day do a giveaway or a sponsored product review... It gets a little frustrating never getting more than one comment on any post just for some feedback! Because while I am mostly doing this for me... or to update family on things, I really do want to connect with other people through this! But I can't really interact or connect if no one is talking to me! Thanks for getting this topic running. yes, and yes. "that blogging is still about the numbers, and not about the hearts." just stop. that is so true. i can get caught up in the numbers game, and the "i must do this, this, and this to promote my blog" and it is so...NOT me. do i want my blog to grow - well sure! do i want people to read my content and comment - yes!! but more importantly i want them to feel connected to me and me to them. you're right, blogging is SO MUCH more than numbers. When it comes to numbers, of course it's inspiring to see that people visit my blog (I use Jetpack stats), but I definitely don't care about "followers" as people who clicked a button. I mainly look at the stats because I'm curious about where people find my blog link. What I think is important on the blog is to see that people come back, read, and leave comments. That's what I call followers, people who actively read, and who care to try to connect. As for promotion, I only share on Twitter, and I have my blog links as signature on different forums. So good! I gave up on Google Analytics forever ago...it's just too stressful to keep up with. I don't judge other people for promoting the crap out of their blog, because we all blog for different reasons. For me, I just love writing. Making money is fantastic when it happens, but I'd rather be able to write about whatever I wanted to and make less money, you know? I feel like I'm seeing and hearing the heart beat of blogging grow fainter and fainter as it becomes a nine to five you know? be an unexpected blessing in my life. Not gonna lie, my pet peeve is when people literally only tweet links to their blog. I've been on Twitter way longer than I've been blogging, and the evolution of Twitter use has just become boring, shameless self-promotion. Numbers are important to me. I'm not going to lie and say they aren't. I love to write, I have a message to share with the world, and I want to know people are actually reading. But relationships are equally important to me. Like I'm about to move to the Atlanta area, and I'm SO excited to meet some of the bloggers I've been reading! While I've been blogging less than a year, I've been reading and commenting on blogs for much longer. Two of those bloggers I've admired for years both live in Georgia! I can't wait to meet them! Oh, thank you for this post!! I was actually just reading a post about understanding your blog's analytics, and it was so over my head. I've been blogging for over four years now, and I keep kicking myself for not being better about understanding my "reach" and my "metrics" and for not doing a good job of promoting on social media. Seriously, these are worries I have...and blogging is NOT my full time job...crazy. While I do care about growing my blog and I'd love to be constantly improving and also meeting more people (which I love) it's so refreshing to think about not putting so much pressure on myself. So thank you for this wonderful reminder of what it's really about. You are so not alone--that's exactly how I feel about blog analytics. I don't understand one lick of it! :) I, too, tried to understand it but just couldn't wrap my head around it. I think that it's easy to feel like you're not "doing your job as a blogger" because of all of the tips and tricks out there. And while they have good intentions, they can also make you feel like a blogger failure (or maybe that's just me?). That's definitely something I worry about, too! 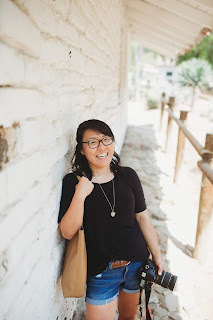 I've always admired how Ashley from Under the Sycamore handles blogging and raising her family. I love that she blogs about her life and kids, but she always does it respectfully and with her kids' thoughts and opinions in mind. Personally, I've always erred on the side of caution. I've actually gone back and forth between wanting to blog about kids (when I have them, that is) and not at all because, well, it's the internet. Confusing, indeed! :) There's definitely a fine line between being friendly and getting the word out and being annoying--and that's something I've yet to master, too. You're right in that it's hard to get conversations started without reader interaction. And I wish I had some foolproof way of answering and solving this problem--unfortunately, it's something I've yet to fully comprehend! p.s. It also might help to link your blog to your Disqus profile--that way we can find your blog through your profile! SO glad you agree (and this is why we're friends!!!). I hope and long for the day when blogging will become about the people and hearts and not the numbers. But I have a feeling that it'll be awhile before that happens because I, too, get caught up in the numbers game. I worry that people won't like my posts, won't comment, and that I won't get any new readers. But like you mentioned, blogging is SO much more than numbers. So much more. I am so glad you mentioned the stress that comes with Google Analytics because I thought I was the only one who found it stressful! And I also love what you said about not judging others for promoting their blogs. I don't want to do that, either, because we really do blog for different reasons. But like you said, I think there should be honest and true passion behind your blog--despite the motivations behind your blogging. And you also brought up a great point--blogging's heart beat has definitely changed since it's become more of a job for people. I think that it is the truth, even if it's hard to swallow. But with bloggers like you, who blog from the heart, there's hope! I think it's just important for bloggers, no matter their following and numbers, to just think about their roots and why they blog. It's a great heart check for me, that's for sure! I mean, it's definitely okay to promote on Twitter. It's just when a blogger literally ONLY tweets about her blog, I hit unfollow. That is boring. Twitter is a good traffic source for me, but I also tweet exciting news in my life, random moments from my day, live reactions to TV or current events, etc. And I try to tweet links to other bloggers when I admire/agree with their writing. We really are blog twins. It's awesome! haha. I love everything you said in this post, and I completely agree. People may have thousands of repins and followers, but do they have readers and commenters? Some do, but many don't. My blog really doesn't grow much any more--just a few new followers every other month or so--but I love the community I have and the friends I have made (some I've met in real life! ), and that to me is worth it more than spending a lot of time promoting my blog. It's also interesting to me to see how many comments and page views I get when I haven't promoted the post at all! Case in point: the post I published yesterday has about 20 comments and a few hundred page views, and I completely forgot to tweet, facebook, or Google + about it! I totally think looking at Google analytics makes me kind of depressed. Like, okay I have a high bounce rate, which means a large # of the people who come to my blog don't click on anything but leave immediately! I don't want to know that kind of thing! haha. I don't because of time and I don't really want to. I love to write and blog but if someone finds it that is wonderful. Thanks for your insightful posts. I'm just gonna throw amen all over this post, okay? AMEN, Amen, AMEN! Numbers shumbers! Thanks for the Disqus tip...just joined to be able to comment on here lol! so good and always so positive and encouraging! I agree that sometimes blogging can be all about the numbers. Which is kinda sad. But I usually wont read blogs that have a crazy design, or their photos don't have effort put into them. I think we all owe it some effort, especially in that area. I do promote our posts, but i don't spend two hours doing it. I don't have time for that. It's nice when i can schedule tweets...etc. Yay! Glad to be of help--all these different platforms and such can be confusing. I just know that having that link is extra helpful for me as a blog reader! Haha, so I wouldn't have had any idea what high bounce rate meant if you hadn't explained it...let's just say that that just proves me lack of knowledge with Google Analytics! But really, I do think that stats in general can make us depressed. Most definitely. I hadn't really thought much about it, but my blog hasn't really grown much, either. But I think the fact that I don't think about it just proves that that's not where my heart's at right now. I really care more about the community and friendships--that's way more important in my book! And I love what you said about not promoting posts and seeing that that doesn't really matter in the end! I totally bought in to the "You can't be a blogger unless you do these things." mentality. Which made me discouraged and I started to shy away from writing and publishing for those reasons. "I'm not good enough or I'm not as good as ______." Don't we all? :) I feel like I fall into those traps all the time, especially since I feel like the blogging world/business is constantly changing and evolving. Girl, you ARE good enough and I'm so glad you didn't give up!!! You are so right, it IS hard. And I think that's one of the reasons why I struggle with it myself! :) It's hard but very good stuff! I will admit I jumped on the wagon to promote like crazy and guess what? It was exhausting and not worth it. Did my numbers increase? Yep! But so did 'blogger burnout'. Someone once told me that blogging is about community and connections and I have tried to do that more. It has made all the difference. Beka, your comment NAILED it. In all honesty, the pins that I see on Pinterest that say "How to grow your blog in 10 steps" and what not are not even worth it to me anymore. I really am all about the community in the blogworld and while big numbers are cool and nice, they're nothing in comparison to the actual people I've befriended through blogging! This is an amazing blog that help in the promotions of your business and blog.